Time for a dance-off against... a Venus Flytrap? I love rhythm games so Before the Echo has been sitting on my Steam wishlist for quite some time - it's only during a sale where it received a ridiculous discount (I think it may have even gone below a dollar) that I managed to nab the game - and now I've finally had an opportunity to play it and finish it. I also noticed that the game had a name change around March 2015 where due to a legal claim by Jax Ltd. the name was changed from Sequence to Before the Echo. However, when I took a look at the Before the Echo logo it reminded me of another game called There Was an Echo which has a similar looking logo and name; turns out this is no coincidence since both of these games are developed by Iridium Studios – in fact, I believe they are set in the same universe too. Something to consider if you're a fan of There Was an Echo. 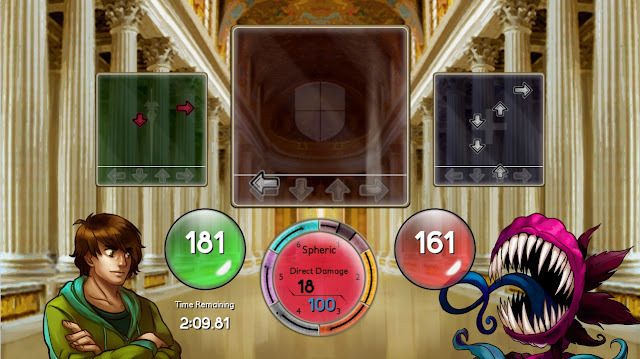 The core gameplay in Before the Echo is similar to other rhythm games like Dance Dance Revolution, or even Rock Band or Guitar Hero. You're given a scrolling board with four keys you need to press (which correspond to the arrow keys on the keyboard) and you'll have to press the correct keys in the correct sequence at the correct time (hopefully in time with the music). However, the game is actually a hybrid of a few genres as it also adopts elements of visual novels and RPGs. It's like a visual novel because the story unfolds in a similar style (just like Puzzle Quest) and it's like an RPG because you have stats you can improve over time along with the ability to attack and defend against enemies. So it does bear some similarities to Puzzle Quest, except instead of using match-3, Bejeweled style gameplay for the combat, you instead have a more advanced rhythm game. I say it's a more advanced rhythm game since you'll actually have three scrolling boards at the same time, instead of the usual one in most rhythm games. Each of these boards represents a different function: one of the boards is used to defend yourself against enemy attacks; successfully hitting the correct key at the correct time means you negate any damage you would've received if you hadn't pressed the keys at the right time. Another board is used to cast spells you'll learn across the way that can either damage your enemy or heal you. Successfully hitting the keys in the right sequence at the right time will result in the spell being cast. Finally, the last board is used to generate mana which is used to power your spells. If you don't have any mana you can't cast any spells. Successfully hitting the keys in the right sequence at the right time on this board replenishes your mana. Having three boards scrolling at the same time means you'll be faced with constant dilemmas: do you take some damage to ensure you perfectly execute a spell or do you waste the mana you saved up for the spell so you can live to fight later on in the battle? Do you decide to generate mana during the easy part of the track at the risk of taking damage or do you just focus on defending? The conundrums don't stop there either since you'll have to decide what spells to bring into a battle, whether it's a weak (but cheap) attack spell, a lethal (but expensive) attack spell, a health siphoning spell, a healing spell or a utility spell (e.g. spells that boost the power of the next spell). What's a rhythm game without a good soundtrack? Not a very good rhythm game, that's what. Thankfully, Before the Echo does have a good soundtrack, so much so that I just had to buy an album by one of its contributing artists: Ronald Jenkees. This guy is a bit of a virtuoso on the keyboard which makes for an energetic and groovy soundtrack. There are other artists that contribute to the soundtrack, but the tracks composed by Ronald Jenkees are my favourites. The game's cast is fully voice-acted and by several professional voice actors too. The game is actually quite well written, which is refreshing to see in a computer game since so often the story takes a back seat to the gameplay (which isn't necessarily a bad thing but why not get both right if you can). There's an abundance of funny jokes and banter, and the main character sometimes reminds me of another smartarse of the gaming world: Guybrush Threepwood. My favourite sequence in the game is when you encounter one of the bosses you have to fight who only responds to commands you'd give to a text parser-based interactive fiction game! The exchange of words between the cast is hilarious. The game has Steam achievements and Trading Cards. Awwww yeah. Despite the game having Steam Trading Cards and Achievements, you somehow can't take screenshots using Steam. Which is a minor annoyance, but an annoyance nonetheless. The last couple of boss battles are ridiculously difficult compared to the previous ones (which I was able to, more or less, cruise through). Consequently I was forced to be a bit more strategic with my battles - I had to learn to use utility spells that I never used up to that point (e.g. ones that could boost the power of other spells) and it took me a whole lot of tries to the point I was ready to give up on the game - but thankfully, perseverance paid off (mind you, I played on Medium difficulty so Easy difficulty might not suffer from the same issue, I cannot be sure). Another way to help you at this last part is of course to keep fighting normal monsters to give you enough loot to craft new armour and weapons, or to just simply level up your stats. Consequently, the game can feel a bit grindy at times since you're trying to level up your character to give you every chance possible in fighting certain boss battles. Also, defeating enemies is the only way of gathering ingredients, ingredients you'll need in order to craft items such as the key to the next level. However, when you kill an enemy there's no guarantee you'll be rewarded with the ingredient you're looking for since the outcome is based on chance. This means you'll often find yourself fighting the same monster types over and over again just so you're able to eventually stumble across the ingredients you need to craft items. This is another way the game starts to feel boring and become a grind. Despite the game feeling a bit of a grind at times and the last couple of boss battles being infuriatingly difficult compared to the rest, Iridium Studios has cleverly morphed the humble rhythm game into a full-blown RPG and it surprisingly works well. Before the Echo has done for rhythm games what Puzzle Quest did for match-3 puzzle games and I like it. Before the Echo is highly recommended for lovers of rhythm games who want a bit more plot and strategy added to the mix. Is the game worth $4.99 USD? : Definitely – in fact, even at full price, this is a bargain for a well-polished rhythm game/RPG with a half-decent story to boot.